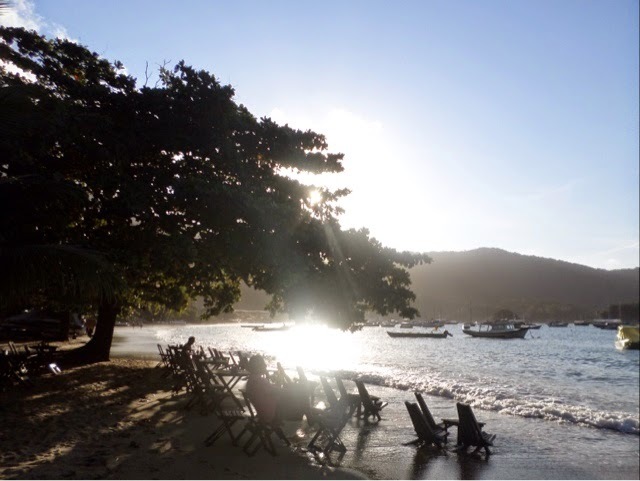 Ilha Grande is a big island, imaginatively named ‘Big Island’. 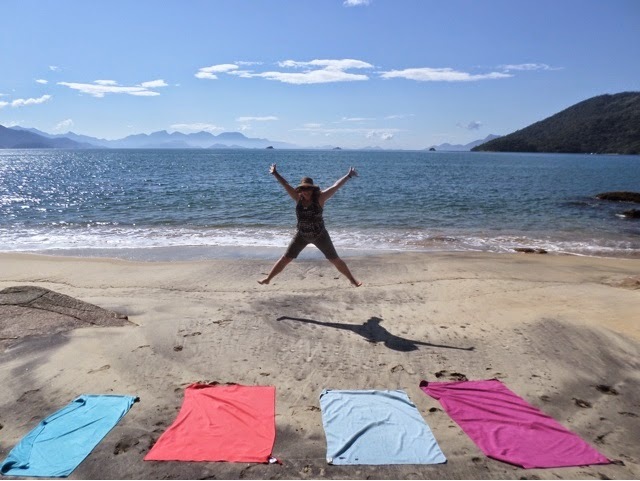 It’s the third largest island in Brazil, with a surface area so 194 sq. metres and is actually a submerged mountain ridge, which is quite cool. The island is tropical and almost 70% of it is protected and is considered to be one of the finest examples of Atlantic rainforest. It’s good that the area is being protected, as many of the species are actually endemic. It’s nice to see a place that could so easily be over developed to allow more tourism being controlled in a sensible and forward thinking way by the government. 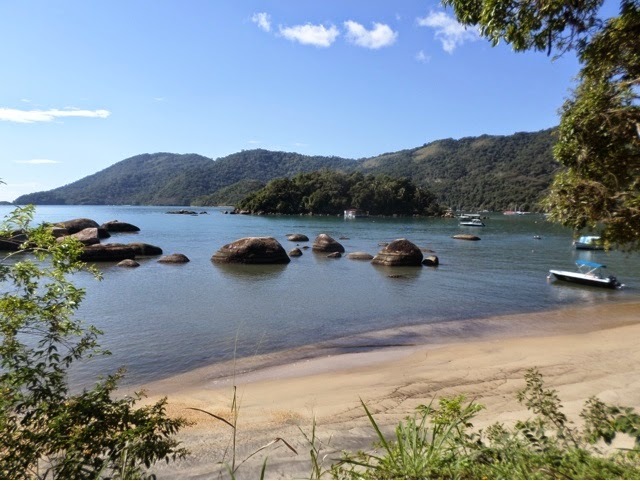 Before settlement Ilha Grande was home to a group of natives called the Tupinambá Indians (Tupi for short). There is evidence of people here dating back 3000 years and the Tupi people were hunter gatherers but also were known to practice cannibalism, scary! Although they all seem perfectly nice and friendly now :-). The Island was them ‘discovered’ by the Portuguese in the 16th century and used as source of Brazilwood. 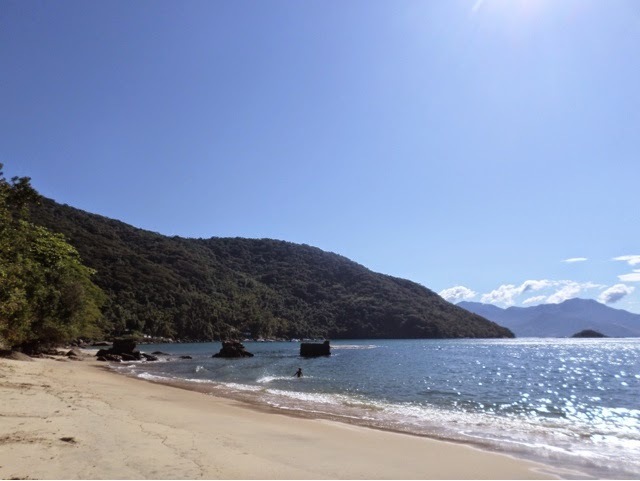 Large scale logging made the industry unviable and the development of mining and the gold export trail to Portugal from Paraty effectively ended industry on the island. The island continued to be used by pirates, due to the number of inlets and sheltered bays, causing big problems for passing gold export ships, until a Portuguese navy was established. The first settlers on the island formed a leper colony, this was then converted to a high security prison, which was then demolished after its closure in 1994. Sugar cane and coffee plantations were also developed across the island and with it the slave trade. Slavery was abolished fairly late in Brazil, in 1888 as it was one of the last places in the world to do so. After abolition the island became a centre of slave smuggling, which was a lucrative business at that time. In the 20th century it became home to a Japanese sardine processing facility. Its main industry is now tourism though and possibly associated flip flop sales. 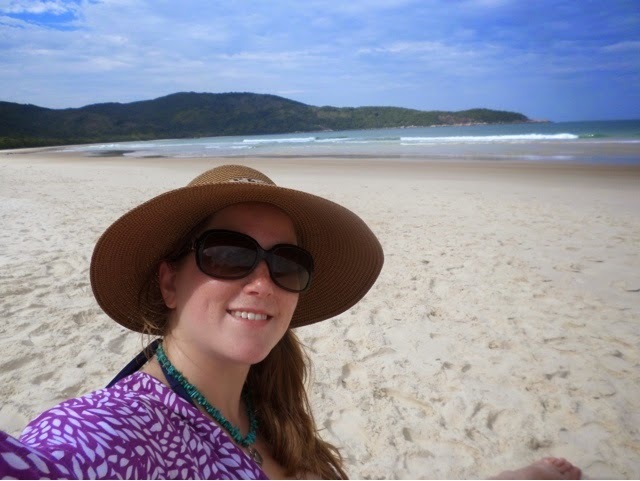 Our hostel is in the only town on the island, Abraão and is right at the top of the only path that heads off up into the hills and is also home to ten cats! I didn’t spot a crazy cat lady though. 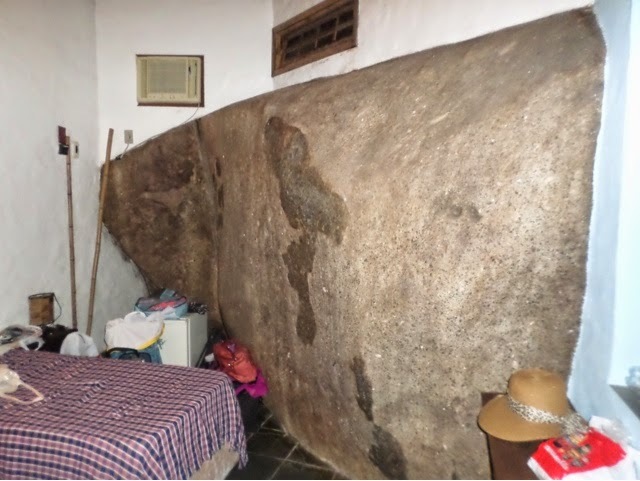 The wall of my room was also made up of a huge boulder – pretty perfect for me! We then headed off on the penultimate orientation walk, what on earth am I going to do when I have to start finding things for myself again! The first stop was the beach, it’s nice that the town is small enough that the pavement runs out within two blocks of the ‘port’ I.e. the two jetties and turns into sand. View of the end of the beach, there are little restaurants all along the beachfront where you can sit on the sand and enjoy a beer, or cocktail… Which we did after having a wander around the town. You can sit with your toes in the surf and watch the sun go down. The next morning we caught a fast boat over to Lopez Mendez beach. You can do a two hour hike, which is supposed to be very nice and which a bunch of people did. However, Karen has an injured foot so we took the quick route. The boat drops you off at another small beach and you then walk about ten minuted over to Lopez Mendez. It’s the islands most famous beach and is over four kilometres long! It’s a very nice beach, but I still think that living in Australia completely spoils you and that it would extremely difficult for anywhere to beat the beaches at home. We sat and chilled out on the beach for a few hours. There are waves, which people attempted to surf, but they weren’t really big enough. It was fairly overcast and not really hot enough for proper sunbathing though being the start of winter. I headed along the beach for a bit of a walk and walked past some pretty interesting characters, including a group of guys with band instruments…. Even including a trombone! 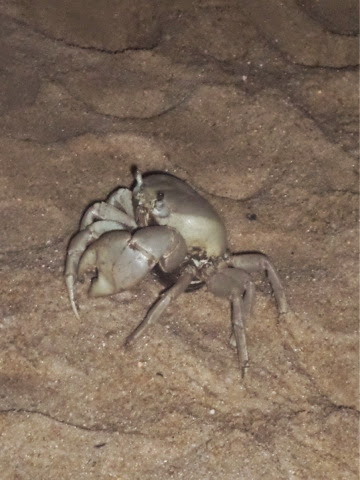 Just what you expect to see on the beach! Several groups of guys had hiked over with their camping equipment too and I think it would be a nice place to chill out for a few days. After walking half the length of the beach it started to rain, then pour and I got pretty wet walking back, so just headed back to the boat and town. The rest of the afternoon was spent hanging out around the hostel, using Wi-Fi___33 and generally sorting out things for the upcoming return to normal life. The following day I had a quiet start and hung out with the girls. We decided to walk to the prison remains it turns out that their only about 200m out from the town though, so it wasn’t really much of a walk! Along the way there are lots of empty little coves and great views. Empty beaches, where they hang packets of chips from sun umbrellas, as you do. The prison remains that we saw are not the famous ones mentioned above which are reached by boat, but another one where they would accept prisoners as they arrived on the island. The prison is called Lazaretto and was originally a farmhouse that was converted into a quarantine centre 1884, after cholera kept breaking out in Europe. People arriving from Europe would stay at the centre here on the island until it was clear that they were well enough to join other settlements. Between 1932 and 1954 it was used by prison services until it was knocked down in 1963. 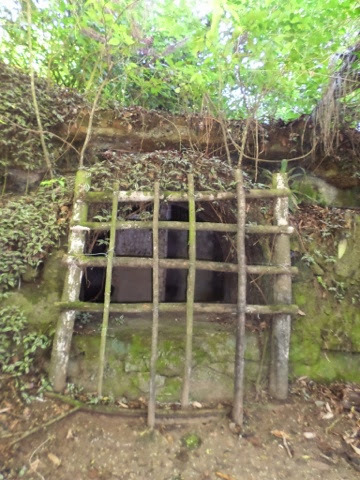 There’s not a lot let to see and you can’t enter the remains. There’s not roof and the vegetation has pretty much taken over. Through several windows you can see in and it looks pretty depressing. 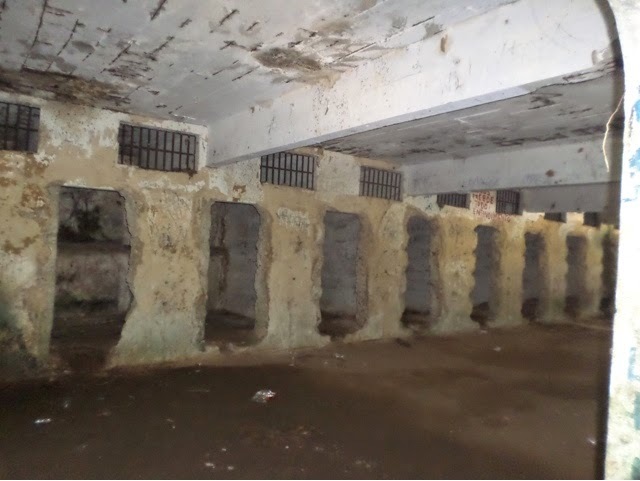 The cells are all fairly small and it can’t have housed all that many prisoners. It seems a bit surreal having a prison only ten metres away from a tropical paradise beach! After having a nose around we headed down onto the beach as it was sunny, horray! After sunbathing and swimming for a few hours the clouds set in again and we retreated just in time. The rest of the afternoon was spent hiding from the torrential rain. 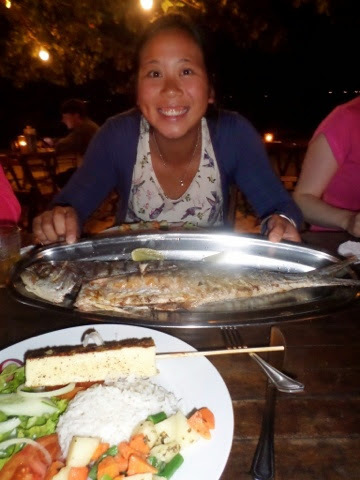 That night we had dinner at a local ‘food by weight’ restaurant. Which is essentially buffet where you can pick what you want to eat and they weight your plate and you’re charged for how much you eat. 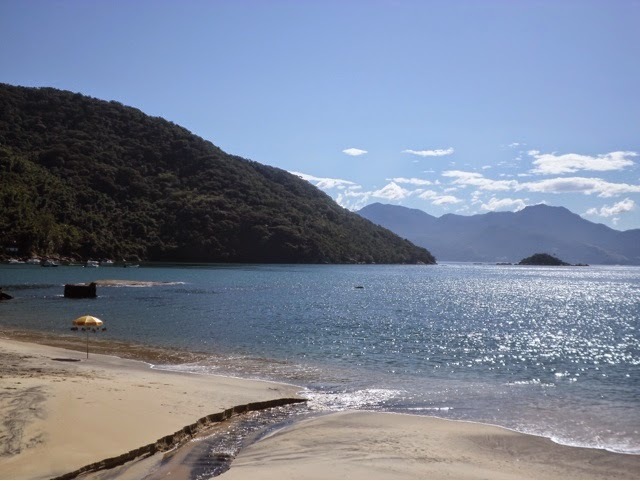 Ilha Grande is lovely and I think you could stay there for 3-5 days before you got bored. It would have been nice to have had better weather to have been able to explore more of the trails though. It has also been nice to have some down time in warmer weather to relax and gear up for Rio and heading home, which is looming ever closer! Finishing the trip in sunny beach towns is definitely a good way to go. The next morning we left the island on a small boat, which luckily was smooth. I can’t believe I’ve managed to survive all the boat journeys on my trip without getting sick once, it’s a miracle! From there a minibus took us to our final destination…. Rio! 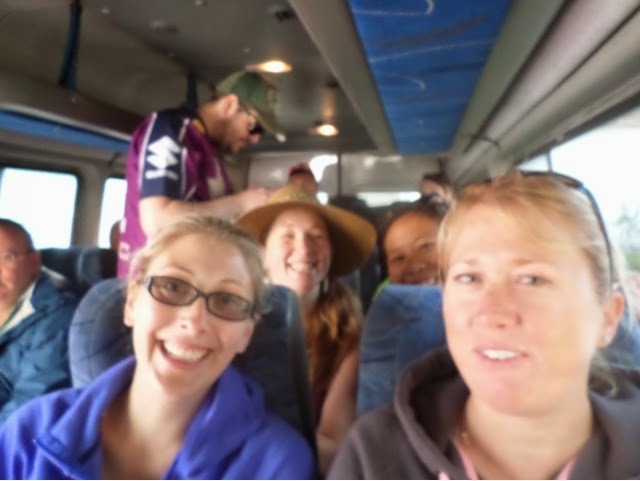 Heading to Rio bus group-selfie! 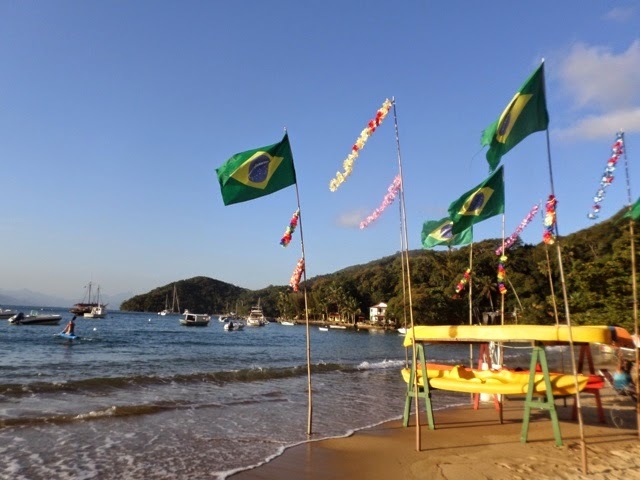 This entry was posted in Travel and tagged Abraão, Beach, Brasil, Brazil, Ilha Grande, Intrepid, Island, Lazareto, Lazaretto, Lopez Mendez, Prison, South America, SouthAmericanAdventure, Travel, Tupi, Tupinambá. Bookmark the permalink.